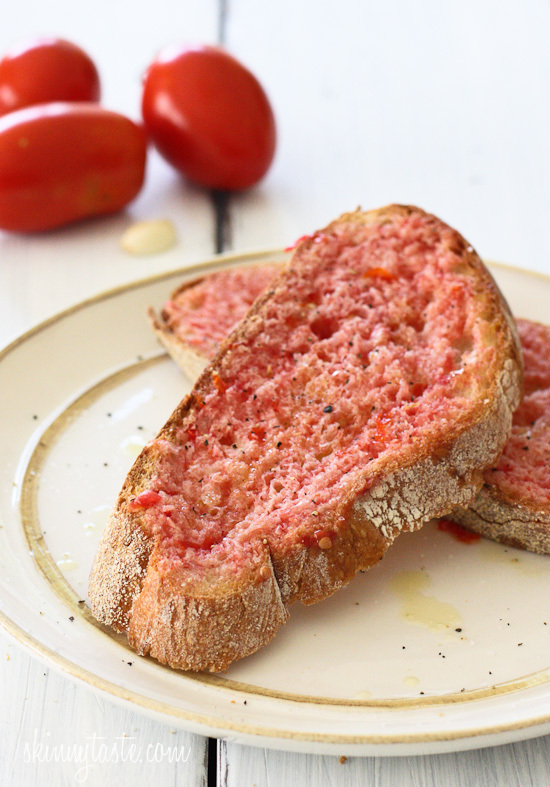 Pan con Tomate or Spanish Tomato Bread – This is what happens when I have a crusty loaf of bread and some fresh ripe tomatoes in my garden! A popular tapas dish from Spain, Pan con Tomato is a tomato rubbed garlic bread. It’s super easy to make and is typically served as an appetizer. I almost forgot how good it was until I was reminded a few weeks ago while having tapas at the Gastro Bar. 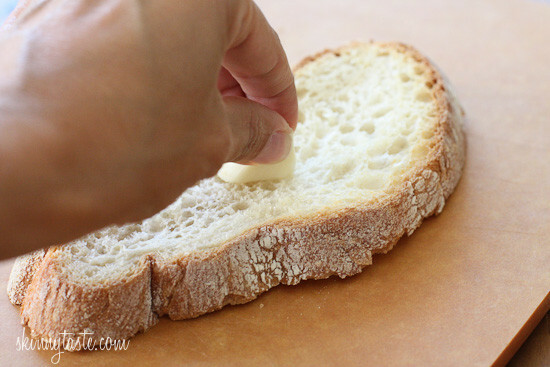 You can use any crusty bread, I used a rustic loaf but a french baguette or Italian bread cut open would work great too. I toasted slightly in the oven, but you can also grill it if you’re dining al fresco. 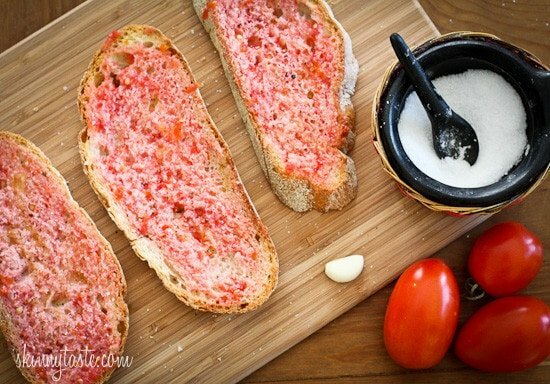 Once toasted you rub a clove of garlic over the bread and a half of tomato. Sprinkle with a little salt, pepper and olive oil and eat. Simple! This is the time to make it while tomatoes are at their peak. If you don’t like the idea of raw garlic, leave it out or use roasted garlic instead! Personally, I can be very happy having this for lunch with a green salad! Place bread on a baking sheet and place in the oven to lightly toast for about 5 minutes, or until slightly crisp on top and barely golden; remove from the oven. While still hot, lightly rub the garlic cloves over the surface. Then rub the tomato halves over the tops of the toasted bread. Sprinkle with salt and pepper and drizzle with extra virgin olive oil; serve immediately while still warm. Oh my goodness, I had completely forgotten about this lovely little appetizer until I saw your post. The first time I ever had it was in an old little tapas restaurant in Barcalona. A local helped us order and insisted on starting with this. The servers brought everything to the table and you assembled it yourself. It was all very charming and perfect with a nice glass of Cava! Thanks for bringing back memories! My name is eli and i'm from Catalonia. 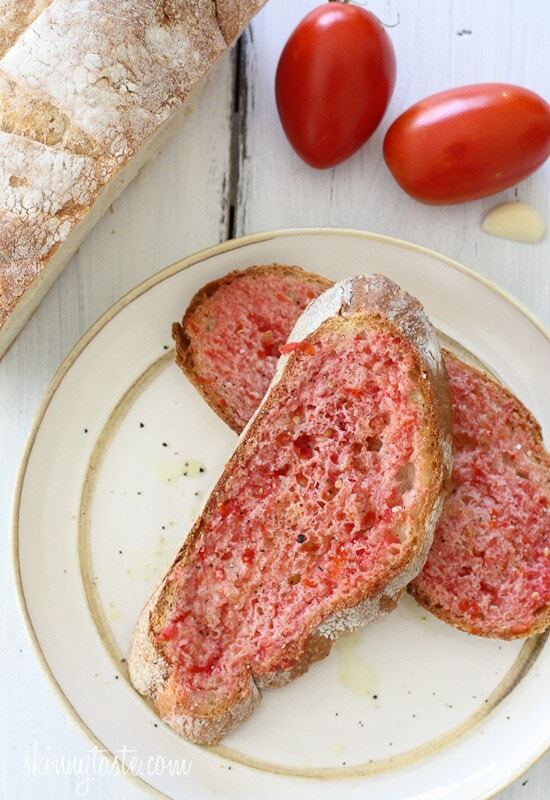 Great one … but the bread with tomato is delicious…. Actually, this is called: "Pa amb tomàquet" and it is from Catalonia not Spain! I can't wait to try this. Thanks for posting. I haven't had this since I went to Spain in high school. I'm drooling already! and what child wouldn't like this dish. and who wouldnt like this bread. Pro- I loved the taste/flavor combination! Con- Mine didn't turn out *nearly* as pretty as yours 🙁 The bread crumbled, and didn't get as nice and tomato-y pink when I rubbed them with the tomato half. I'll definitely give it another try, though! We just made this tonight using crusty olive bread and served with spaghetti alia e olio. Absolutely Delish! I once had this in Spain and I've been making it ever after. I always have to tell people "its a kind of bruschetta" because no one ever knows what it is. I toast the bread directly in the toaster and for people who dont like the idea of raw garlic I've found that mincing the garlic and mixing it with the olive oil, then heating the mixture in the microwave a bit works well, just dont let the oil "boil". This was awesome! Guests were super impressed and it was so easy! It will be a go to recipe when entertainment for sure! We toasted the bread on the BBQ…so easy! My husband and I went to Barcelona on our honeymoon a few months ago and we had this for dinner every day! It's great by itself or with some jamón serrano and/or manchego cheese. We are so addicted. Interesting! i have to try this. Im sure my husband will love it. Ay, ay, ay! Pan Tumaca! Always good! Love the jamon adittion, but by itself, with great olive oil and a good crusty bread to get the garlic falvor…sooo good! This is a fave breakfast of mine when I go to Spain. When back in the States I top this with some Boars Head turkey. It's yummy, gives you protein and stays low in points. It's also a good alternative for cream cheese/butter when my family brings in bagels! What a neat thing to do with the bread- can't wait to try! G, this has to be the prettiest bread I've ever seen. How delicious it looks and being I'm a bit of a sucker for tomatoes….well bless my heart and pain me red. I am completely jealous of your beautiful tomatoes. Ours are all ugly and half-rotted by the time they are even close to ripe. Lots of carving them up. As someone else said before "Pa amb tomàquet" is a typical Catalan dish. In many regions of Spain it's not eaten at all (for example in Madrid or Sevilla). Catalan people (Costa Brava, Barcelona, Costa Daurada, Sitges…) have it with either toasted or not toasted bread. We never eat it with black pepper but we do "season" it with a lot of extra virgin olive oil. Moreover, "Pa amb tomàquet" it's never eaten alone. It is usually the "base" to have all sorts of cold meat like "jamón serrano", fuet, salsichón, chorizo, etc.. Another typical Catalan recipe, as someone said before, is to have the slice of bread totally covered with grilled aubergine and zucchini. Simply delicious! 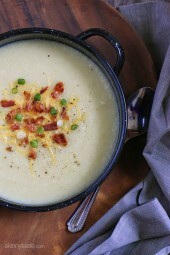 If you want to know a bit more about Catalan cuisine, feel free to visit my blog: http://alfristoncottage.blogspot.com . Hope you enjoy it! This looks divine! So simple, I'm sure it is delicious! 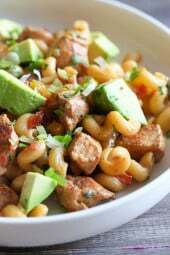 The most basic recipes seem to yield the tastiest dishes it seems. I will definitely be giving this a try! If you are every in the Monterey, CA area you should go to Carmel and eat at a little Spanish tapas restaurant called Mundaka. It's tiny and decorated with salvaged materials from buildings that burnt down in San Fran. Everything is fresh and locally grown. The restaurant only seats about 40 people so it's intimate and the service is wonderful. sounds wonderful, I was in Carmel not too long ago, loved it! I went to La Bicyclette and adored it. Wonderful!! My teen loved Madrid and wants to go back next summer. I eat this all the time…. LOVE IT…..Here in Spain where I live we call it Pan Tumaca…. Yum, I love this breakfast. I like to add the (not low-fat, but certainly not low-taste) jamón ibérico (http://en.wikipedia.org/wiki/Jam%C3%B3n_ib%C3%A9rico). It's for 2 oz of bread. Depending on the size of the loaf that can be around 2 slices. Yes…YES!! Like Emily, I first had this in Barcelona (I had won a trip to the Olympics in '92)…and I had it with manchego as well. So good…so very good! I really want to try this! 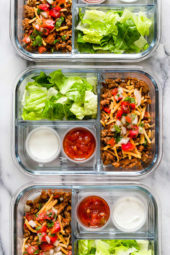 It looks so easy and looks delicious! We always order this when we go to tapas restaurants! Fantastic recipe! How interesting! I'm pretty finicky about tomatoes, but this sounds like the flavors are perfect! 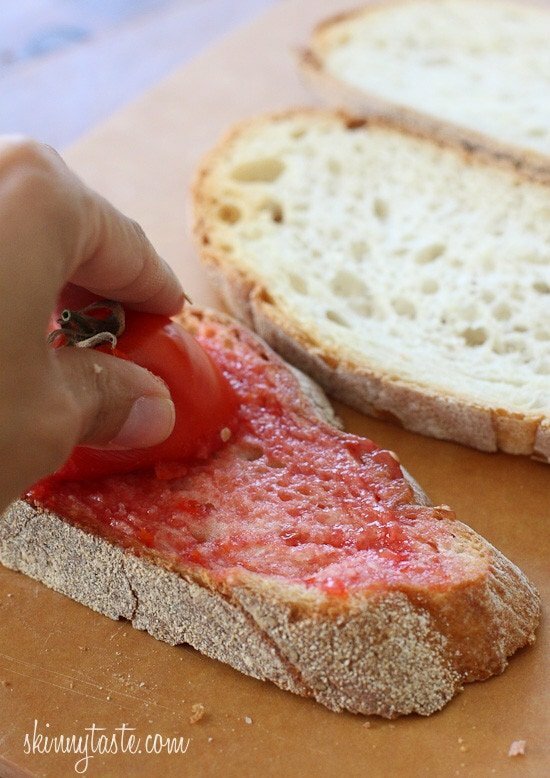 I ate pan con tomate like it was my job when I lived in Spain. forgot how good it is!!! MMM. making some tonight! LOL, I am jealous, I want that job! Omg this looks DELISH! I have to try this! This looks so delicious! I actually had this when I was in Barca but didn't know what it was- and mine was topped with thick slices of manchego cheese… perfection! Can't wait to recreate that and serve with sangria! Perfect timing! I'm going to a girls dinner and the theme is tapas!! I'm for sure bringing this, I think I ate this with every meal when I was in Spain. I bet a few slices of hard boiled egg would be good on top too…if you wanted to beef up the protein factor for a more filling meal…yum! I bet any sandwich would be great with this! In Spain we call it… Pan con tumaca, if you want to make it even better layer some Serrano Ham on top!!! oh my! i miss having this for breakfast! So good, you can make it! We had this for the first time on our honeymoon in Spain in May. I immediately fell in love. I tend to puree the tomatos in a food processor. I take english muffins and toast them. I will use a misto to put a little olive oil on them when they come out of the toaster. I spread the tomato puree (and there's more left for later or tomorrow) and top with a little salt. It helps with the portion control so you're not tempted to cut another slice of bread and the nooks and crannies of the english muffin provide a way to hold on to the tomato puree. This looks like a delicious afternoon treat!! I might just have to try this. I also need to start a garden. I am so jealous of people that have gardens, you inspire me that you have one. Tomatoes are easy to grow, you can even do them in a large bucket. This is something I crave. Something that hits the spot! This bread comes specially from Catalonia and it is called: Pa amb tomaquet. I come from Catalonia and I am very proud to read about it in your blog. If you roast some red pepper, aubergine and onions in oven or in the barbacue, that´s called escalibada, it taste really good with it. Sounds wonderful, my daughter studied abroad in Madrid this summer. I hope to go to Spain soon! I had this at a Spanish restaurant in Asheville and LOVED it!